Malaysia has lost an incredible patriot, a legend and true national hero. All his life, he fought for a Malaysia based on justice, freedom and equality. For his untiring efforts, he was harassed, jailed and was in the process of appealing a further attempt to jail him when he died so tragically. It is telling that all Prime Minister Naib Tun Razak did on learning of his passing was to offer a one line sentence of condolence. No eulogies to a great Malaysian. No recalling of his sterling service as a lawyer and parliamentarian or his contribution to the nation. The Prime Minister should be ashamed of himself that he allowed his own brand of petty politics to dictate his response. The government may not honour him but there is no doubt that millions of Malaysians will honour him in their hearts and remember him for his sacrifice, dedication and commitment to the struggle to make Malaysia a better place for all its citizens. Sadly, he did not live to see so many of his cherished dreams for Malaysia come to pass but the dreams live on and the struggle continues. Others will take up the torch. One day we will have a government of the people, by the people, and for the people and on that day, the nation will celebrate Karpal Singh for the true hero he was. He will be dearly missed and mourned by all Malaysians who love and cherish freedom & democracy. Our condolences to his family. Veteran opposition MP and lawyer Karpal Singh was killed in an accident near Kampar in Perak this morning. Karpal’s son Ram Karpal and the driver were believed to be injured in the accident which occurred at 1.10am near 301.6km northbound marker along the the North-South Highway. in Kampar – show the white Toyota Alphard badly damaged. Contacted later, an Ipoh police spokesperson told Malaysiakini that it is believed the MPV collided with a lorry which switched lanes without indication. Karpal’s other son and Puchong MP Gobind Singh Deo (left) told The Star that his father had died on the spot. “My brother Ram is slightly injured but we are trying to get through to him,” he added when the daily contacted him at 3.30am. According to a police statement later, Ram and driver of the ill-fated car, C Selvam, were not injured. However, Karpal’s Indonesian maid suffered severe injuries and she is warded at Ipoh’s Hospital Permaisuri Bainun. The driver of the lorry, which was hit behind by Karpal’s car, and its three passengers escaped without injury. Karpal, 74, was involved in a previous car accident in 2005 where he was paralysed and wheelchair-bound. The vocal politician graduated from University of Singapore and started his law practice before running for Parliament in 1978. His long tenure as Jelutong MP and fiery speeches in the Dewan Rakyat earned him the moniker “Tiger of Jelutong”. Karpal had recently relinquished his post as DAP chairperson pending the disposal of his appeal against a sedition charge. Last month, the High Court found him guilty of uttering seditious words against the Sultan of Perak at the height of the constitutional crisis in 2009. Meanwhile, Prime Minister Najib Abdul Razak conveyed his condolences via Twitter. “I have just landed at Ankara when I heard the news that YB Karpal Singh died in a road accident. My condolences to the family,” read the premier’s tweet. Other netizens also expressed condolences and shock over Karpal’s passing. “Shocked and sad news! 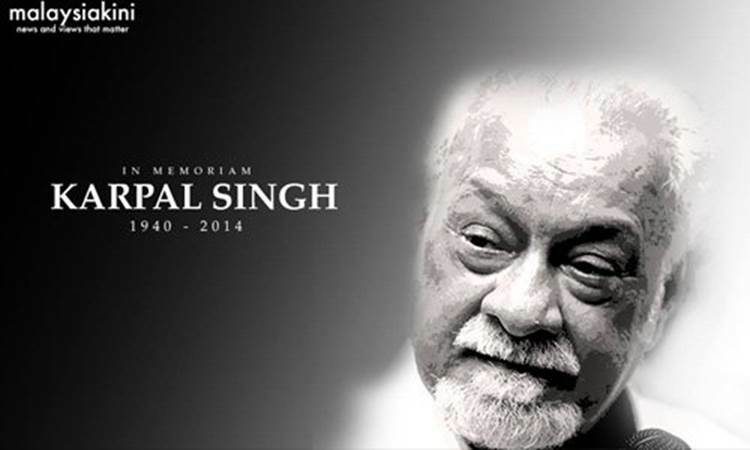 DAP chairman Karpal Singh passed away in accident tonight. Malaysia has lost a truly patriotic son,” wrote Taiping MP Nga Kor Ming. “Our dear Mr Karpal is no longer with us… I just can’t accept it…,” said Kulai MP Teo Nie Ching. The bodies of the two deceased, Karpal and Michael, arrived at the Ipoh General Hospital at 7.20am. Penang Chief Minister Lim Guan Eng (right) and his deputy Mohd Rashid Hasnon, and former Perak menteri besar Nizar Jamaluddin were there. They conveyed their condolences to Karpal’s sons Gobind and Jagdeep. Karpal’s wife was seen crying, while a relative tried to prevent photos from being taken. The bodies were sent for post-mortem.